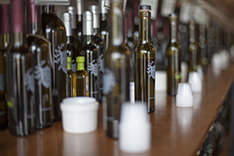 Gourmet infused olive oils and balsamic vinegars line the walls of this small shop. Dark Chocolate Balsamic, Herbs de Provence Infused Olive Oil, and White Truffle Gourmet Oil are a few great finds here. Unlimited sampling is welcomed and kitchen gifts and accessories are also available.